The SPUF of Legend has been pretty sparse recently, and part of the problem is that I have had some serious trouble finding a recording software that can handle Overwatch, a game that has proven incapable of playing well with my old mainstays. Almost everything I record on Steam is FRAPS, and it does its job just fine. Recording is easy, the resulting video is amazing quality and you can port the video directly into Sony Vegas Pro (my video editing software of choice) and start editing. It’s also great for games like Planetside 2 that for some reason refuse to let you take screenshots via either Steam or PrintScreen, as I’ve never found a game that FRAPS can’t photograph. My biggest complaint would probably be filesize; the videos you get are always humongous. I have a ten-minute recording of Killing Floor 2 that takes up 21.3 gigabytes. The level of quality definitely shows up in the final video, but it can quickly become a huge drain on memory space. And last but not least, it doesn’t work with Overwatch at all. Whenever I tried to record, I’d get horrifying lag spikes at the worst possible time. The game wasn’t kidding when it warns you that FRAPS is an unsupported software. OBS is probably perfect for more patient and experienced videographers than myself who are prepared to mess with bitrates and channels and encodings until it’s perfect, but I was eventually turned off by the number of bugs and dropped videos that kept happening. Nothing whatsoever would change in my settings or my computer and suddenly there’s a brand new problem turning all my recorded footage into useless garbage. Worst of all, the mp4’s you get from OBS Studio are incompatible with my version of Sony Vegas Pro; I wouldn’t get any audio if I didn’t disable a perfectly-good compression feature, and doing so resulted in videos buffering easily 5 times slower. Finally, after scoring a record 42 kills as Lucio in a single match and finding that OBS failed to record it, I abandoned the software and began the search for a new one. And at the moment, I am extremely happy with Plays.tv, which I think was forcibly installed on my computer when I updated my AMD graphics card. 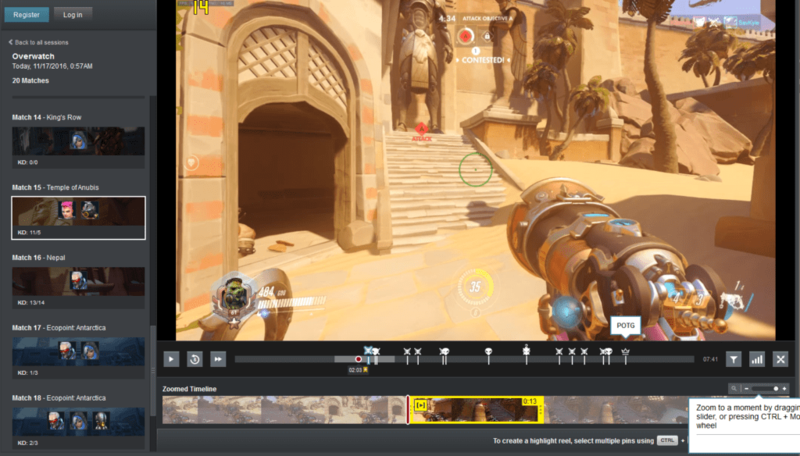 I dismissed it out of hand for this reason, but now that I actually gave it a shot, I’ve found it an amazing software that was handcrafted for recording in Overwatch. Not only does it have the Shadowplay-esque quality of recording everything I do in-game, it also automatically splits video files into specific matches, and when reviewing these files in the Plays.tv viewer it’ll also display thumbnails showing the map, character class, and your KDR for the resulting footage. While watching a video, the timeline shows you where kills, deaths, and the Play of the Game fall on the recording, a functionality I’ve never expected but absolutely adored. Just look at all that information. Made it a breeze to search through my archives to find the notable matches/moments. I have no clue how many games Plays.tv can give you this in-depth information for, surely it can’t be all of them. But it’s really awesome and it blew my mind how useful it all was for sifting through hours of Overwatch footage. The filesizes are also pretty reasonable, for the most part it feels like a standard Overwatch match takes up 1GB of recording. Also I didn’t have to do anything to get it to start recording great footage, no settings manipulation or dropping my in-game quality. The resulting footage is instantly usable in Sony Vegas Pro and I’ve experienced no performance losses during gameplay. My primary complaint involves microphones; the only two options are a constantly-active microphone or a disabled microphone, there are no push-to-talk or separate-channel options, so I have to keep my microphone disabled because I don’t want my breathing and keyboard-typing to infect my footage. The devs have stated they’re open to adding this functionality in the future, and I hope they do because it’s the one thing holding me back from giving an unequivocal glowing review. But Plays.tv still gets a 9/10 and I highly recommend anyone give it a look. I know it’s all I plan to use for the time being. Previous Previous post: Killing Floor 2 and Pokemon Sun & Moon are released!